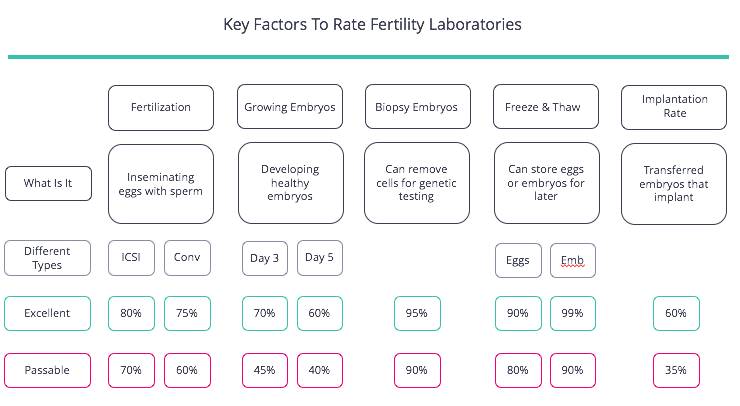 FertilityIQ: How You Can Measure Lab Quality? How You Can Measure Lab Quality? We think of the laboratory as a mill because it’s work flow is linear: it must fertilize eggs, cultivate embryos, be able to biopsy those embryos for genetic testing, and then be able to freeze embryos (or eggs) and thaw them for future use. The continuum, along with rates of mere “competence” and “excellence” look something like this. We’ll cover each in this chapter. Conventional Insemination (CI) occurs when the egg is surrounded by droplets of sperm and left overnight to fertilize. Intracytoplasmic Sperm Injection (ICSI) occurs when the embryologist selects a single sperm and injects directly into the egg. Both techniques require sophistication and practice. According to the panel of surveyed embryologists a “passable” laboratory should be able to fertilize a minimum of 60% of retrieved eggs using CI and 65% of mature eggs using ICSI. We believe those numbers are low and the floor for acceptability should be 70%. A “benchmark” laboratory should have fertilization rates into the high-70s, or low-80s, for either procedure. When performing ICSI, “benchmark” laboratories should damage less than 10% of the mature eggs available. Once the eggs have been fertilized, laboratories have the daunting task of trying to grow embryos to a stable state. This is a difficult process and many laboratories are only able to keep embryos alive for 3 days, up until a point when the embryo has 8 cells and enters “cleavage stage.” This is still a very fragile period for embryos. More sophisticated laboratories can grow embryos to “blastocyst stage,” when the embryo has hundreds of cells and is more developed and stable. The earlier an embryo reaches blastocyst stage (often on Day 5), the quicker it grows and the healthier it is. 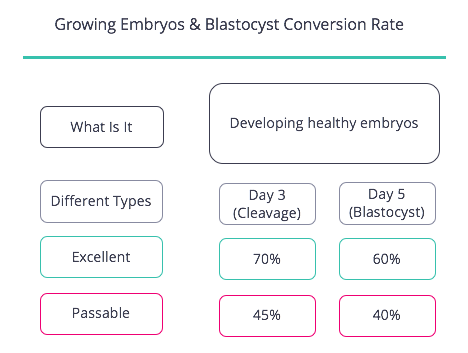 In many laboratories, blastocyst embryos are more likely to lead to a live birth than cleavage stage embryos. We recommend only going to a clinic with a laboratory capable of growing embryos to “blastocyst stage.” If a laboratory insists upon doing Day 3 transfers, “passable” labs should be able to grow 45% of fertilized eggs to Day 3, whereas the exceptional “benchmark” labs should be able to grow 70% of fertilized eggs to this stage. If your laboratory aims to do a Day 5 transfer, “passable” labs should be able to grow 40% of fertilized eggs to Day 5, and exceptional labs should be able to grow 60%. Should you want to genetically test your embryos, your clinic’s laboratory will need to cleave a few cells from the embryo and send them to an outside “reference laboratory” for testing. When embryologists take too few cells from the embryo, no reading can be made. When the embryologist takes too many cells, as one laboratory has recorded (see below), live birth rates can be impaired. For this reason, if you think you want, or need, to have your embryos genetically tested, you should go to a clinic that is skilled at biopsy. There is no perfect measure for excellence here but a good measure is the “Successful Biopsy Rate,” or the proportion of embryos that were biopsied so that enough DNA was detected in the sample for a good reading. “passable” labs should have 90% success rates and exceptional labs should have 95% rates. Unfortunately this measure does not account for how often an embryologist takes too large a sample, which is problematic. 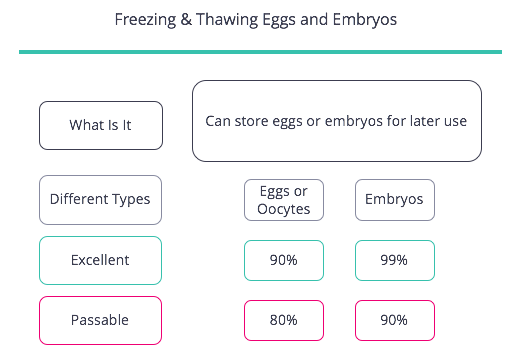 The majority of IVF procedures today involve freezing at least one embryo for potential future use. The preferred method for freezing is “vitrification” but it is not easy to master. Therefore, it’s important to look at a laboratory’s “Blastocyst Cryosurvival Rate” or the percentage of embryos that survive after thawing. Here, “passable” laboratories have rates around 90% and exceptional “benchmark” labs are closer to 99%. Freezing and thawing eggs is harder than embryos and so success rates are lower. The embryologist panel decided “passable” laboratories should have a 70% success rate and exceptional laboratories an 85% rate. We disagree and believe the floor for a passable laboratory should be 80% and exceptional “benchmark” laboratories should be closer to 90%. Ultimately, we need a way to measure whether the lab’s efforts achieved their aims. 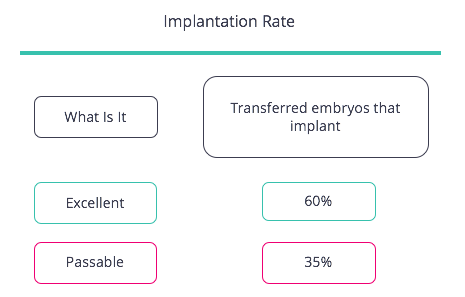 We almost always favor “live birth rate” or “ongoing pregnancy rate” but most embryologists look at “implantation rate” which is the percentage of transferred embryos that result in a gestational sac seen on ultrasound. In this case, surveyed embryologists believed “passable” laboratories had 35% implantation rates, whereas exceptional laboratories were closer to 60%. 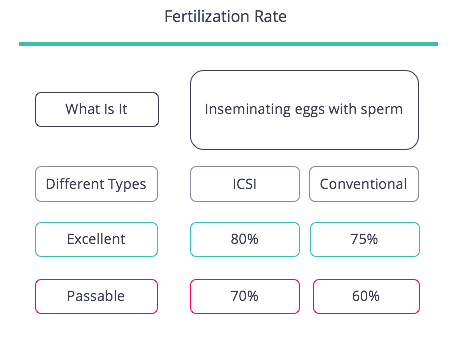 Ensure your laboratory has a fertilization rates for CI of at least 60% and for ICSI of at least 70%. What Is A Fertility Laboratory? Accreditation & Does It Really Matter? Time Lapse Imaging Systems -- Do They Help?